Hard work at the gym requires quality protein to restore the muscle fiber. 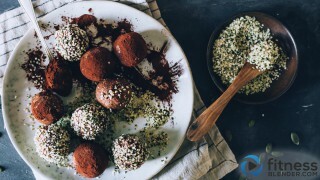 While lean meat or a quality plant protein combination (such as legumes with rice) are a great choice if you're having a meal after workout, these protein power chocolate truffles are the perfect post workout snacks, especially if your workout is in the afternoon, because they give you energy for the rest of the day. Almond butter – almonds are not only a great source of healthy, monounsaturated fats that balance hormone production and regulate your mood, but also a good source of magnesium, the mineral you need after the stress of an intense workout, and amino acids, needed for building the protein blocks. Hemp hearts or hemp powder – hemp is a complete source of protein, containing all the essential amino acids, which is quite rare in the vegetal world. It also contains omega 3 and omega 6 in high concentrations, alongside minerals such as magnesium, zinc and iron. Coconut flour – it's not only about its delicious flavor, but also the protein and high fiber content. Oats – are a great addition to these little snacks because of their amino acids concentrations, and also for their fiber. Raw cacao – while refined cocoa has a delicious taste, once you taste the raw cacao you won't come back to its refined version. The flavor is more intense, and the health benefits are exceptional because of its antioxidants and minerals. And it's also a great energy booster! Dried dates – are an exceptional potassium source, necessary for balancing the healthy cell activity after workout and maintaining its alkaline environment. While their protein addition is not high, their natural sugars gives your body energy. Related: Are artificial sweeteners safe? Are they harmful or helpful for weight loss? Combining these ingredients in balanced quantities (adding too much oats will result into a thicker texture) and adding enough coconut oil to blend everything and help them stay together after hardening into the refrigerator – these are simple steps for obtaining delicious little truffles with raw ingredients only. Drain the dates and pumpkin seeds, and add them into the food processor together with the coconut oil and almond butter. Process to obtain a fine puree. Add the rest of the ingredients and pulse to incorporate. Shape little balls using your palms and add them onto a plate with hemp hearts and cacao powder.